These lines are to say thank you for the perfect ser­vice that we had during the trip through the Ukraine. It was unforgettable experience for me. Its culture, history, ownership of its land, enterprises are signifi­cantly different from Argentina’s one. According to the presentation that we had we under­stood that you are going right way cooperating with universities, learning trading system etc. Our tour area was south from Kiev to Odessa. We vis­ited beef, dairy and arable farms and were very im­pressed with the quality of stock and crops. Your deep black, stone free and easily worked soil was admired with envy. Your scale of operation was massive, with huge fields of 500 acres, without hedgerows or fenc­es. We enjoyed Ukrainian culture and impressive city tours in Kiev and Odessa. All the guides in RealTOURS were very professional, knowledgeable and helpful, all in all a wonderful experience. exotic country that is not member of EU. Technical visits were interesting because of dif­ferent kinds of farms. City tours were very informa­tive in spite of we didn’t have a lot of time. Hotels were comfortable and food was good quality. Tour guide from RealTOURS was very attentive and the interpreter has good language skills so we had great connection. The group recommends to visit Ukraine again the only thing they wish is tour was longer. Thank you for arranging such a wonderful tour for our visit to Ukraine. Even though we complained about the roads, our experience with visiting and touring and eating was great. Tour guide did a wonderful job of looking after us and giving us information. Again THANK YOU for the great visit. 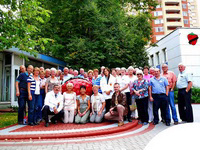 We had a very nice study tour to Ukraine. We would like to admit excellent organization of this trip. It turned to be a good mix of agriculture, culture and good experience. 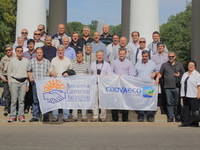 Managers of the farms we visited were open-minded and presented us a great job. Both our guides were doing their best. They were always ready to help us and keeping an eye on us, so no one get lost or get in trouble. 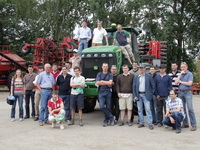 Ukraine was more “hands on” and we did appreciate the contact with the farmers and Mill staff very informative and really enjoyed the day spent out of Kiev. I would have liked another day “out in the field” looking at more farms but again I felt this would have been more difficult for you to organize but hopefully you will take this on board for future tours. perspective we would be coming from. I also think it was very interesting to compare and contrast operations of Kees with some of the ones we saw over the next couple of days. We whole heartedly recommend RealTours for anyone who is traveling to Ukraine and wants to have a great experience! We are very pleased with our visit to Ukraine. The farms we visited were interesting and variated. The guides were good and very service minded. The hotels were good. The lunches and the dinners were good. In total we are very pleased. good hotels with good rooms and good breakfast. Good services. good meals (lunch and dinner). Could have been more various dishes. good and various/different farms visits! Good to see small and big farms. Friendly and nice people. It was nice to learn more about Ukraine. The alternative stay in Kyiv on Sunday was nice and interesting. I was blessed with the opportunity to visit Ukraine with Michigan Farm Bureau and Greenstone FCS for an agricultural study tour. It was an absolutely amazing experience and I want to share some of what we learned in Ukraine. 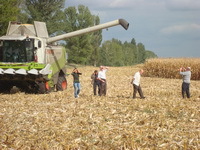 While in the country we visited a dozen or so Ukrainian farms, ranches, companies, and processors. 10,597 miles by air and 1,695 by road made for a lot of travel over the past 10 days. 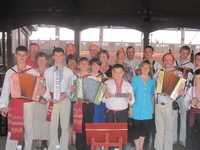 That travel was filled with information about Ukrainian agriculture, their economy, their politics, and their culture. Best of all it was filled with time to make new friendships both with my comrades that I traveled with and our Ukrainian hosts. We chose Ukraine because of its unique position on the global stage. Ukraine is unique because its developing potential, once fully realized, will make it a major player in the world marketplace for several key commodities of tremendous export and processing value. The scale and quality of their grain harvests already have a substantial impact on world markets, but that's really the tip of the iceberg. They've made huge strides already, but there's much more to come.